This week is Fix a Leak Week! In conjunction with the EPA partnership program, Water Sense, San Diego plumbers encourage homeowners to take the pledge to check their plumbing fixtures and irrigation systems. Every drop counts and more than 1 trillion gallons of water are leaking from American homes, each year! To help you participate in Fix a Leak Week, we are sharing a few helpful tips for fixing common plumbing leaks. If you want to be a part of the solution, but aren’t the DIY type, call a reputable San Diego plumber. In winter (colder months), a family of 4 should not exceed 12,000 gallons per month. Check your past water bills to see if you have been using an excessive amount of water; this would indicate a potentially serious leak. Check your water meter, then do not use the water for 2 hours. Check it again – if the meter has changed, sneaky-sneaky, leaky-leaky! Check for surface leaks on pipes. You can tell if your faucet gaskets or pipe fittings have water on the outside of them. Toilet leaks are commonly caused by old, worn out toilet flappers (a.k.a. valve seals). Flappers can collect minerals and decay over time, but they are inexpensive and fairly easy to replace. 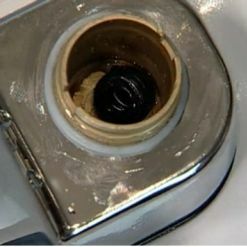 Turn off the water supply and look for old or worn gaskets (may also be referred to as washers). Depending on the type of faucet, you may need to remove the temperature knobs or handles as the washers will be located inside/underneath them. Replace gaskets that look bent, cracked or otherwise deteriorated. The connection between the showerhead and the pipe should be nice and tight. If it’s not, you can use Teflon (pipe) tape. While you’re in there, also check the washer or O-ring inside your showerhead and replace if needed. If your leak is serious, outdoor or you suspect damage to your foundation, walls or floor, contact us immediately to avoid further, costly damage. Take the pledge and fix your leak this week!